Bought one of these to use for last minute getaways and glad I did easy to erect and put away (when you get the knack!). First time we used there was a tiny patch of water on the inside of the roof (may have been condensation) so I sealed the roof seam. Second night we used it the rain was pouring down all night but the inner stayed completely drip free so no regrets at all in buying it. You can just about get two single air beds in it but you are probably better using a double. I don't like pitching tents or packing them up. While having an excellent 6 berth, I find it takes me an hour to unwind after having struggled to put it up, and folding metres of wet tent in the pouring rain at the end of a short break is not my idea of fun. If I'm away for a week, fair enough. For a night, forget it! I wanted a roomy popup tent for my 5 year old daughter and I. 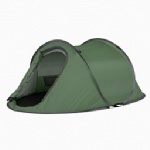 One which could cope with the elements, was big enough for her to play in if it rained, and would suit weekend camping. The Eurohike Mach III has measured up superbly. 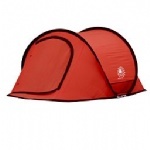 Purchased from Millets, I was impressed by the quality and size of this popup tent, not least because it has headroom. I can put on my jeans in the morning without having to indulge in horizontal acrobatics. This is a decent sized tent for two adults. It concerned me that being larger than the other popups I'd seen, it would be difficult to pack away. No problem. After a single demonstration, I was able to pack up without any difficulty, and in seconds (and sniggering slightly that for once I wasn't kneeling in the mud getting soaked). It pitches in seconds too. Lazy man's camping. Wonderful! It takes more time to deflate the air matts and roll them up than it does to pack away the tent. The first two occasions that the tent has been used have been in high winds and reasonably heavy rain. No leaking, and where another tent was blown away and two others collapsed, mine stood up to the punishment. It was so windy on the second day that it was impossible to cook. The wind was coming from all directions and despite having a shelter to cook in, we couldn't keep the stoves alight. The Eurohike was still standing though! We packed up in minutes and it was back home for a fry up. The only negative of this type of design is that the tent has no porch area, otherwise I'd have given it ten out of ten. That said, there is enough room at the foot of the sleeping matts for clothes and boots, so perhaps I'm being mean. Add your review of the Flash Mach III!